If you happen to have the same questions as the above ones, this guide would be exactly what you want. We would like to share different solutions on how to read Adobe Digital Edition books on iPad tablets with you below. Many people who have purchased books from Adobe Digital Edition don’t know why they can’t read Adobe Digital Edition books on iPad tablets’ iBooks reader. Actually, this is all about DRM. Short for digital rights management, DRM is a set of access control technologies for restricting the use of proprietary hardware and copyrighted works. Works, including video, music, audiobook, eBooks, data files, etc. with DRM protection will get protected from being edited, modified, used, republished, and distributed by unauthorized people. To use the DRM protected content, you need to get authorized by the content owner. Otherwise, you have to make use of DRM removal tool to remove the DRM protection, which might be illegal according to local laws. The Adobe Digital Edition eBooks are also DRM protected. Therefore you can’t directly import the eBooks from Adobe Digital Edition to your iPad iBooks ereader to read Adobe Digital Edition books. But you still have choices to realize, which are listed below in detail. Since 2015, Adobe has made Adobe Digital Editions (ADE) app available for iPad tablets on iPad App Store. 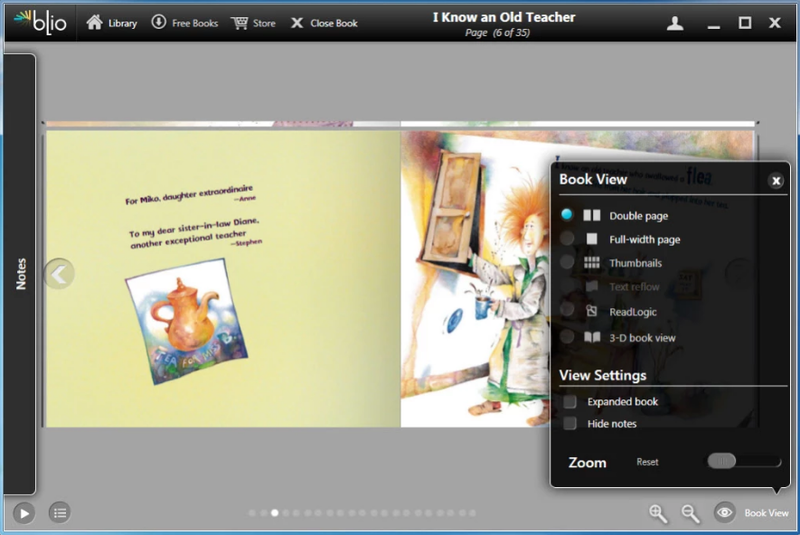 ADE app for iPad enables you to read all Adobe DRM protected books across your iPad, Mac or PC. It is totally free to download and use, and completely ad-free. 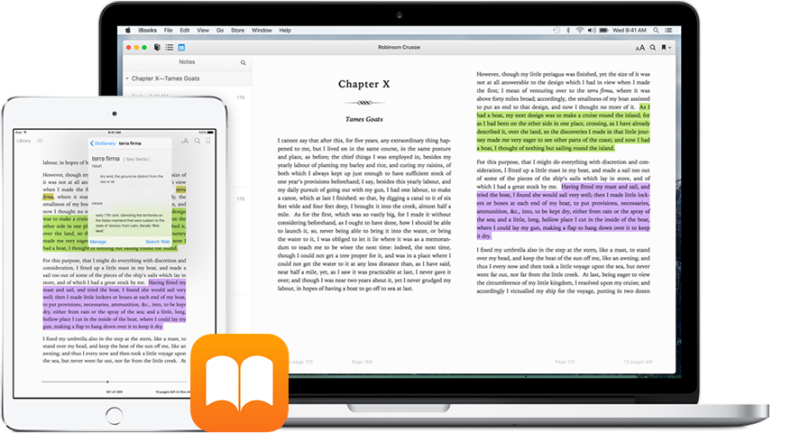 ADE can be used to read EPUB and PDF books, both online and offline. 1. Open your iPad tablets and go to the App Store. 2. Search for Adobe Digital Edition and then click the download icon next to it. 3. When the downloading and installation finish, open the Adobe Digital Edition app. 4. Log in with your ADE account and password. 5. Then you will find all your purchased ADE books are listed on your ADE app on iPad tablet. This would be the easiest way to read Adobe Digital Edition books on iPad. You don’t need any extra app or cost. Secondly, we would like to recommend you different Adobe Digital Edition alternative apps to help you read books on iPad. Of course, with these alternative ADE apps, you don’t need to purchase books from ADE anymore. Some of these ADE alternatives are even free to use and provides free books for you to read. Check them below. iBooks is an amazing way to download and read books. It includes the iBookstore, where you can download both the latest best-selling books, and your favorite classics. Browse your library on a beautiful bookshelf, tap a book to open it, flip through pages with a swipe or a tap, and bookmark or add notes to your favorite passages. You could even add your local PDF or ePub eBook files to iBooks on iPad for unlimited on-the-move reading. It’s a top-notch Adobe Digital Edition alternative you could get on iPad. What’s more, it’s a native eBook reader on iPad. Bluefire Reader is your go-to reading application for ePub and PDF content, including ebooks from most online book stores and leading libraries around the world. Bluefire Reader includes support for eBooks protected by Adobe Content Server, a wonderful Adobe Digital Edition alternative for reading Adobe Digital Edition books on iPad. This eBook reader is available for both Android and iOS devices. What’s more, it’s totally free. Simply put, Blio is a full-featured eReader for people who care about what books look like. If you’re into crafting, architecture, cooking, traveling, or fairytales, it’s pretty important to see your books laid out like the author intended. That’s why Blio recreates each and every page, giving you an authentic reading experience, while still giving you all the extras you’d expect from an eBook. With these 3 alternatives to Adobe Digital Edition, you could also read books on iPad tablets. Some of these Adobe Digital Edition app alternatives allow you to directly read Adobe Digital Edition books on iPad, while the others enable you to get target books from their own book store or add eBooks from your computer to iPad for reading. As we mentioned above, eBooks purchased from Adobe Digital Edition are all DRM protected. Therefore you could only read books purchased from Adobe on Adobe Digital Edition or other eBook readers authorized. You could download Adobe Digital Edition app for iPad to read Adobe Digital Edition books on iPad directly, or turn to Adobe Digital Edition alternative apps to read books from other sources. However, there is still another way, in which you could read DRM-locked Adobe Digital Edition books on iPad effectively. That’s to make use of Adobe Digital Edition eBook converter, which enables you to remove DRM protection from Adobe Digital Edition books and then convert ADE books to DRM-free ePub book files for iPad’s iBooks. Leawo Prof. DRM is such kind of Adobe Digital Edition eBook converter. As a professional DRM removal and DRM eBook converter, Leawo Prof. DRM could perform as Adobe Digital Edition eBook converter to help you remove the DRM protection upon Adobe Digital Edition books, and then convert DRM Adobe Digital Edition books to DRM-free ePub, Mobi, TXT or AZW3 files. With Leawo Prof. DRM, you could easily read Adobe Digital Edition books on iPad and any other eBook reader. Download and install Leawo Prof. DRM through the below links. And then follow the below guide to learn how to convert DRM Adobe Digital Edition books to iPad ePub files with Leawo Prof. DRM. Launch Adobe Digital Edition app on your PC and log in your Adobe account to authorize to this computer. Make sure you have downloaded the purchased books you want to read on iPad on your Adobe Digital Edition app. Launch Leawo Prof. DRM and then click “Add Files” button. On the popup “Add Files” interface, open “Library > Adobe” tab consecutively. You will see all downloaded Adobe Digital Edition books here. Choose the ones you want to read on iPad and then click the “Add” button. After importing the eBooks, you could check the detailed information about loaded Adobe Digital Edition books. 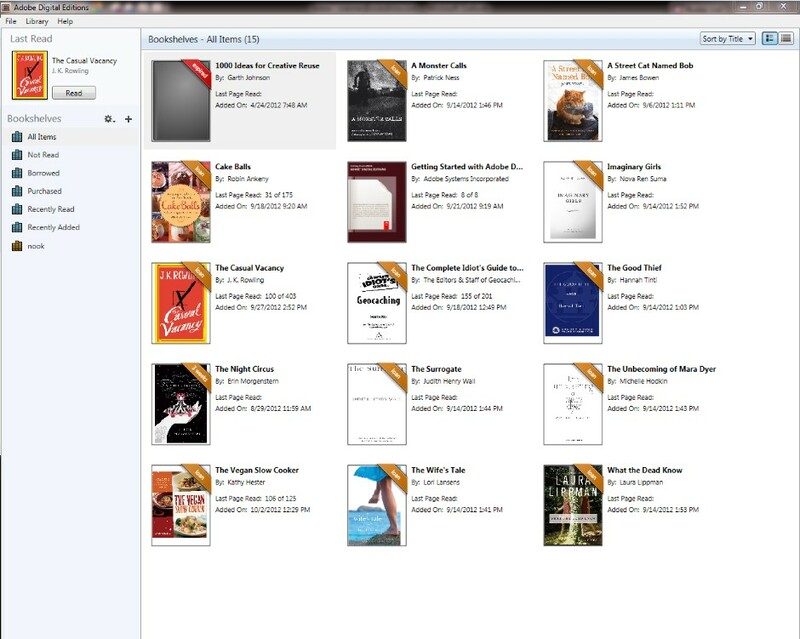 Then choose a loaded eBook file and click the “edit” icon to select epub as output format. For your convenience, check “Apply to All eBook Files” button under the “Option” tab. Then, move the mouse to the bottom and open the “Output” box to set output directory to save the converted Adobe Digital Edition books. 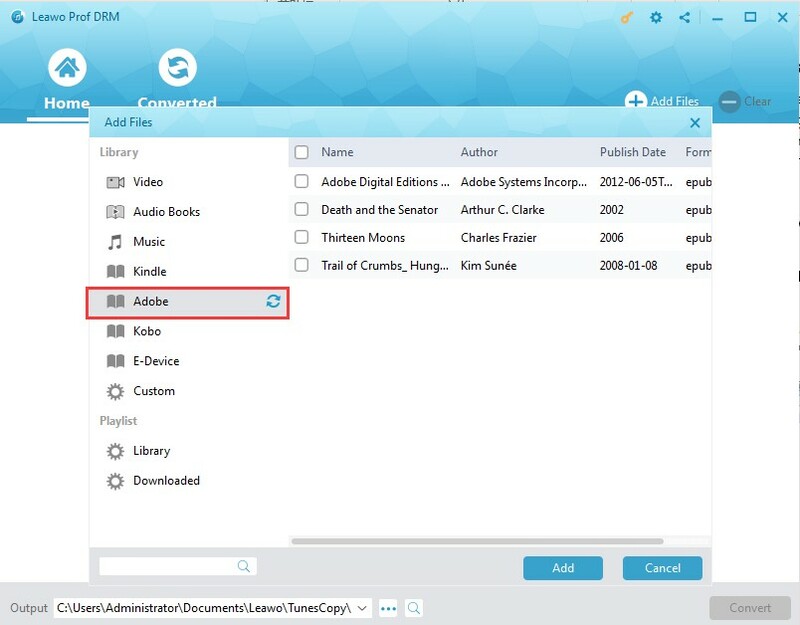 After setting output directory, click the blue “Convert” button at the bottom right to start removing DRM protection from Adobe Digital Edition books and converting ADE books to DRM-free ePub files. You could then view the whole converting process on the converting panel. When the conversion finishes, you then need to transfer the converted Adobe Digital Edition books to iPad iBooks. You could make use of iTunes or 3rd-party book transfer app to transfer books from computer to iPad. After transferring, you could then open iBooks on iPad, and then read the converted Adobe Digital Edition books on iBooks freely. Actually, Leawo Prof. DRM is far more than an Adobe Digital Edition book converter. It is a comprehensive eBook DRM removal and converter that could remove DRM protection from Adobe Digital Edition books for converting, and convert Kindle eBooks and convert Kobo eBooks as well. All the above solutions enable you to read Adobe Digital Edition books or other books on iPad, as either Adobe Digital Edition alternative or Adobe Digital Edition book converter. The below table would display their differences to let you get more information. Obviously, Adobe Digital Edition app for iPad is a wonderful eBook reader app for iPad users to read Adobe Digital Edition books. People could also purchase books from Adobe with ADE app for iPad on iPad. ADE alternatives only let you read eBooks on iPad, few of which enable you to read Adobe Digital Edition books on iPad. Leawo Prof. DRM is a professional eBook DRM removal and converter tool to help you remove DRM protection form ADE books and convert DRM ADE books to DRM-free ePub, Mobi, TXT or AZW3 book files for reading on any eBook reader that accepts books in these 4 book file formats.